One Drive for Business sync. The functionality sounded great. Allow me and my team to efficiently access and collaborate on local files synced from centrally located SharePoint libraries? Off-line edits and additions magically syncing and merging with my teammates changes once I establish an internet connection? SharePoint power and security plus DropBox like sync? Sign me up. When it works, it is fantastic. But, even if you adhere to all best practices, and give it the best possible chance to succeed, you will eventually run into sync issues. Which means stop syncing the library, delete cache, re-sync. And do it again when it next time it breaks. To be fair, this is MUCH better than the old SharePoint sync mechanisms – SharePoint Workspace or Groove. And, I understand how difficult it is to reliably sync any data, much less documents that dozens of people may be collaborating on. I know Microsoft is working to improve it and they have shown they can make great progress when their energy is focused. Lets hope the complaints of thousands of people that just want it to “sync like Dropbox” are being heard by the people that can direct that focus. Having said all of that, I will add that I love SharePoint and think it is underutilized by many Office 365 customers. We rely on it heavily at Clarus. We have excellent bandwidth at the office – it doesn’t make sense to sync copies of files to all of our desktops. But using a browser as the sole vehicle for accessing files doesn’t work for me. So, we map drives to libraries. This gives us the look and feel of regular local files and the ability to move files around that is not possible now via a web browser. We still have simultaneous, multi-user edit capabilities for supported file types, but no sync headaches. 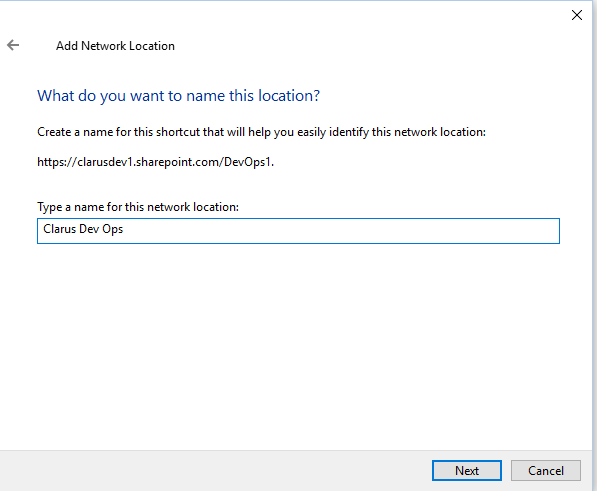 It is possible to map a drive to SharePoint or OneDrive for Business and maintain the connection through reboots. With one caveat (of course there is) – you need to log in to SharePoint and browse to one of your mapped libraries when you reboot. And…you should do this with Internet Explorer (IE). The purpose of this is to keep the security token for SharePoint active. **Technically we are “Adding a network location” but start the same way we would map a drive. 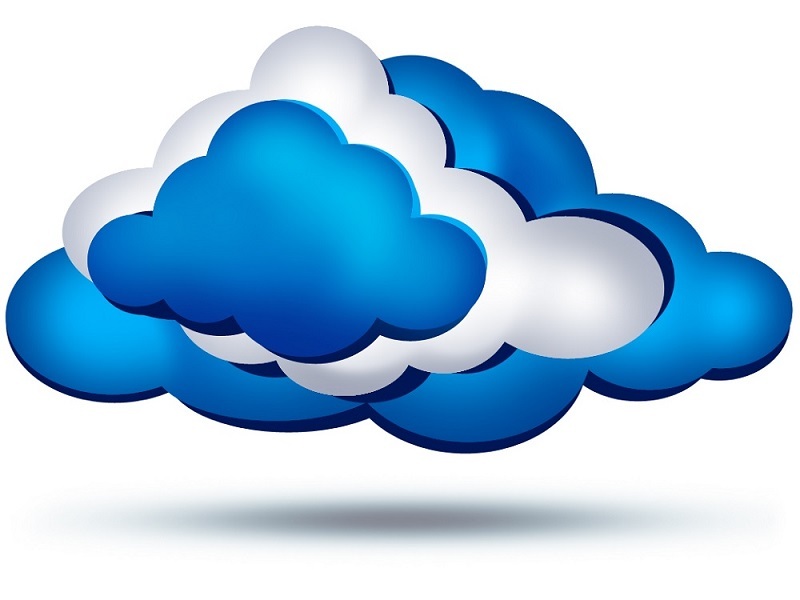 This functionality relies on WebDAV and the Webclient service. So, to do this, you need to know the path you will use for the mapped drive/network location. Use IE to browse to the SharePoint library you want to map a drive to. The URL in your browser will not work for our mapped drive – we need to know the true path. To get this, click on the Library tab, then click the “Open in Explorer” button. Again use IE – Open in Explorer does not work in Chrome. Windows Explorer should open and you should see the contents of your Library. That is the path we want. Copy that into the clipboard. ***One Drive for Business is a little different. You Cannot “Open in Explorer”. But, unlike a regular SharePoint Library, you can make out the necessary path easily enough. For a One Drive for Business path, navigate to One Drive for Business and click Files. Copy everything prior to “/_layouts/” from the address bar. 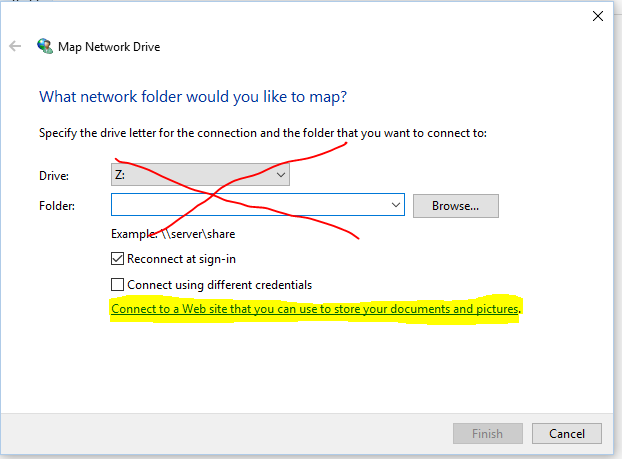 Then, bring up the Map Network Drive dialog (right click This PC / My Computer and choose “Map Network Drive”). Do not use this first screen for mapping your library. This mechanism will not survive reboots without some serious gymnastics you do not want to deal with. Click the “Connect to a Web Site…” link (highlighted below). 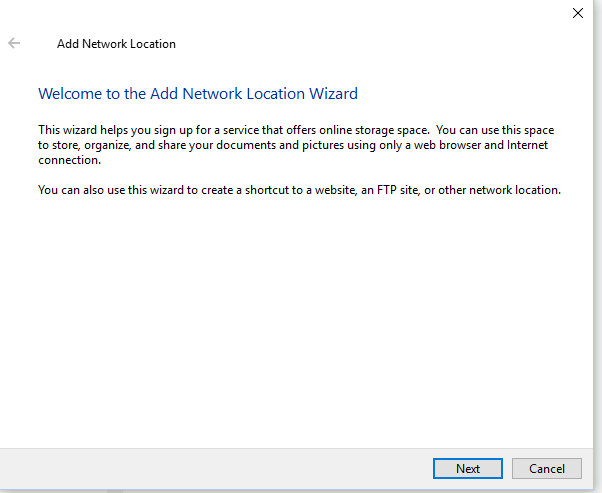 The Add Network Location Wizard appears. Click Next. 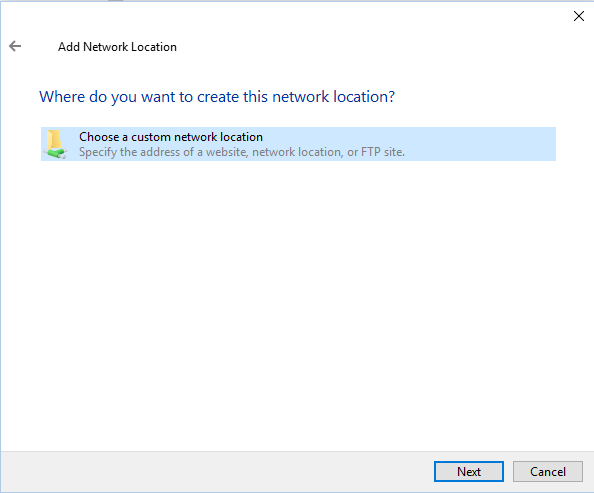 Select “Choose a custom network location” and click Next. Paste your Library or One Drive for Business path that you copied earlier into the address field. Give it a name, then Click Next, Next, Finish. And there you go, a mapped SharePoint Library that will survive reboots. Just remember to log into SharePoint using IE from time to time and the necessary security tokens will be present to maintain the connection. 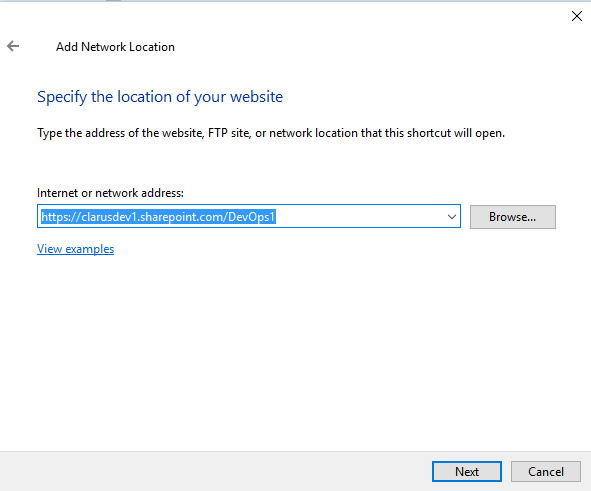 If you browse to one of your mapped folders and you receive an error message, chances are you either do not have an internet connection, or the security token has expired due to an extended period of time without touching SharePoint (logging into SharePoint via IE and minimizing it counts as a touch). Simply log into SharePoint, browse to any library and “Open in Explorer”. All your mapped libraries will be accessible again. I have gone months without needing to do this. This is ideal if you are desktop user with solid internet connectivity and bandwidth. Keep in mind, if opening a 10 MB file, it is going to open as fast as your down speeds will allow. With fast internet being ubiquitous and much cheaper these days, this is a viable option for many businesses and home office based users.